Persian Yarn is well known around the world for its superiority for needlework such as Needlepoint, Embroidery and Cross Stitch. 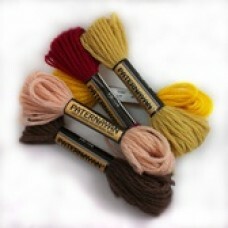 Paternayan were the original manufacturers of 100% Persian Virgin Wool Yarn. This thread is now produced by Colonial with permission from the original spinners of Paternayan Persian Yarn, and is the same 100% Persian Virgin Wool. Paternayan is a 3 ply thread and provides superior coverage on a wide range of canvas sizes by simpl..